Jewish Americans served as the main creators behind the growth of the Broadway musical in the U.S., but what does the Broadway musical have to say about issues of race, especially the racial identities of its Jewish creators? 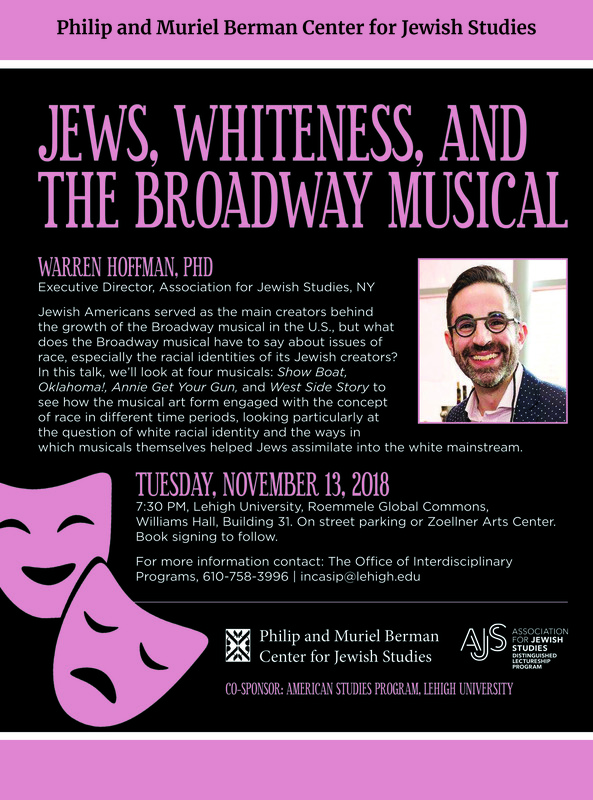 In this talk, we'll look at four musicals: Show Boat, Oklahoma!, Annie Get Your Gun, and West Side Story to see how the musical art form engaged with the concept of race in different time periods, looking particularly at the question of white racial identity and the ways in which musicals themselves helped Jews assimilate into the white mainst ream . 7:30 PM, Lehigh University, Roemmele Global Commons, Williams Hall, Building 31. On street parking or Zoellner Arts Center.